Little Miss Moneybags: Flexible spending! Prescriptions My birth control pills run $16 a pop four times a year. Add in an antibiotic prescription just in case, and it comes to $80. Over the counter Say $50 for over the counter medications. Dentist The last couple years, I've spent a few hundred bucks at the dentist each year. Cleanings are free for me, but I've needed cavities filled and a few root canals and crowns. I expected to need another root canal this year, but I've been taking much better care of my teeth and it looks like I don't--which means I put aside several hundred bucks that now needs to be spent elsewhere. Expected: $500+; reality $0. Vision, therapy, etc. I'm done with therapy, I no longer need vision care since I'm still covered for yearly checkups under my Lasik plan. Total: $180 in expected spending. I was already well-stocked on Vicks vapo-rub, Pepto-Bismol, Tylenol, and Advil so I didn't go there. 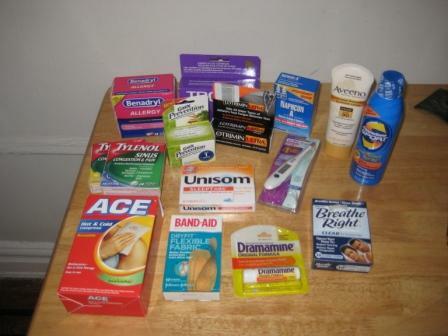 I missed out on a few things I could still use, like topical anti-itch ointment or cream (think Calamine lotion). I've still got $700 to spend. What else should I get? Some of the great things the plan covers are condoms, sunscreen, topical acne medication, allergy products, bandages, eye drops, etc. Things that are NOT covered include dental care products (toothpaste, mouth wash), feminine care products (tampons, pads), toiletries like chapstick, moisturizer, q-tips, vitamins and supplements, and gym fees. I'll be checking with the dentist to see if there's any other work I can get done this year and also visiting specialists (dermatologist) and a general practitioner for a whole bloodwork routine, but what other OTC stuff would you get, if you were in my situation? I have awful problems with allergies, so personally would stock up on antihistamines, hayfever stuff, and eczema stuff.